In the last post, we ended with our application structure. In this post, we’ll start with our first user story As an unregistered user, I want to see the home/landing page. There are a few things to point out in this short user story. First, we have identified a role of the application in the form of an unregistered user. Also, the story tells us that we need to have a home page that is not protected by authorization. It’s a simple, if criminally familiar, home page. There are links to sign in and register, a largish image to promote the site, and a divided area below to put information about the awesome of Loccasions. 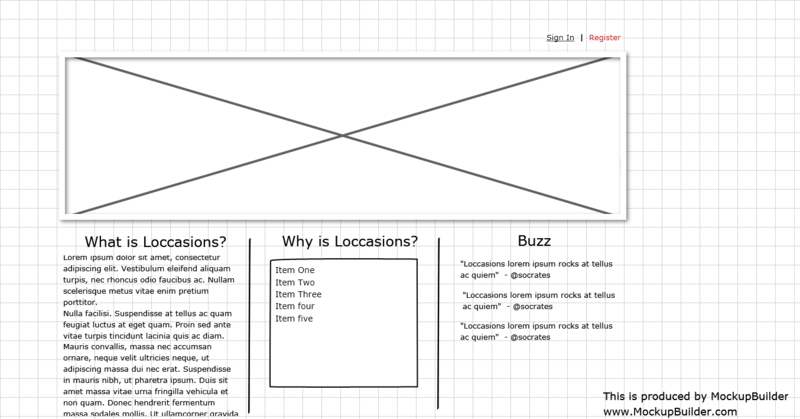 The layout feeds into a grid system nicely, which is no mistake. Before we take that mockup through the looking glass, we need to setup our test environment and write a test (or two) to validate our page. I mentioned Daniel Kehoe’s (@rails_apps) excellent tutorials in the last post, and I am relying heavily on them to setup the test environment for Loccasions. The output to this command complained that the Mongoid config didn’t exist (ugh, first mistake), so we need to generate it. That gives us a config/mongoid.yml that will drive the creation of our databases in MongoDB. Re-running rails g rspec:install and rspec is happy (unless, MongoDB is not running) again. In between test suites, we want RSpec to clean up the database. The database_cleaner gem performs this task for us. Add the following to the spec/spec_helper.rb file. to get the capybara RSpec matchers. That gets our test environment into a state that we can get going. There are still a couple of things to set up, but we’ll do that when it’s more pressing. Just to make sure that we haven’t broken anything, run rake -T at the command prompt and make sure you see the RSpec tasks. If all is well, run rake spec and RSpec should tell you that it has nothing to do, which is a good thing. As expected, the spec fails trying to find a “Sign In” link. Right now, we are still using the default index.html in the public directory, so let’s delete it. Running the spec again, we now see a “Routing error” which, again, makes sense as we have no root route. Based on previous Rails apps and convention, let’s make a “Home” controller with an “index” action. Next, we need to point our root path to the index method on our new controller. Open up config/routes.rb, remove the get "home#index" line and replace it with root :to => "home#index". Running the spec again brings the return of the no “Sign-In” link error. If you rerun the spec, it passes. Just like that, our first user story is complete. It’s Miller Time! Feel free to look over the layout and index Haml files and see how I met our spec. Once you are comfortable with Haml’s syntax, the details of our layout is much less interesting. git commit -am "Added home page and layout"
Next time, we’ll start with another user story and see where that takes Loccasions. As always, I am interested in your opinions and comments about how the series is playing out. BTW, the font used for the Loccasions header is Eight One by glue.